Inspired to challenge viewers to rethink their relationship to the screen after attending the Venice Biennale the summer prior to his studies, David Han began creating experimental videos during his MFA at York University. If I have convinced you to attend the MOCCA: Empire of Dreams show, you’ll definitely remember his work- you know, the car. Han is the first person to admit that the unforgettable, yet arguably gimmicky presence of a 70’s model station wagon within a gallery setting is both a blessing and a curse. Inside the faux wood doors the fully functioning car has been “retrofitted” into a sort of private movie pod. The piece, entitled Margaret learns to Drive from There to Here, was first exhibited at the Leona Drive Project in 2009, for which it was originally commissioned. The radiantly youthful Han sheepishly admitted that after the Leona Drive exhibition several parents approached him to express how much their children had enjoyed the piece. I can’t blame them really. The excitement of riding in a normal station wagon was enough for me as a child, so I can’t imagine how much more truly fantastic this experience could have been through younger eyes. Novelty aside however, the choice of the once ubiquitous family vehicle for this project couldn’t have been more conceptually fitting. Inside the car, three separate video loops, each lasting 23 minutes, project suburban views from every window. Han shot the video loops in Willowdale, just north of Toronto, while driving the same one-block route at different times of day. So while at first the scenes might not seem to match, after time the viewer may notice that they are watching the same drive from different angles. The voices dubbed overtop of this suburban reverie reflect the changing demographics and new populations of our city’s outlying areas. Sit in the wagon at any one time and you can listen to the same patch of dialogue culled from the classic 50’s portrayal of the American dream, Father Knows Best, translated into Mandarin, Cantonese, Farsi, Russian or Korean. 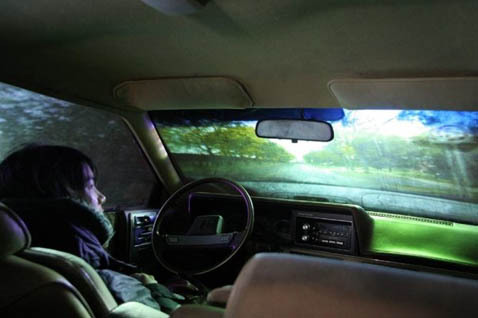 The disquieting knowledge that what you are experiencing is a projection completely separate from the world existing outside of the car creates an eerie uneasiness that helps one to understand Han’s layered insights. Within the obligatory privacy of Han’s car-cinema, the art-gazer is left to ponder the deeper significance of the their own act of watching. The re-purposing of the windows as screens draws solid parallels to the psychological disconnect of the commuter to their surroundings. This unnatural emphasis on this often unperceived barrier provokes the viewer to think about the experience of being detached from the external world, unmoving, yet being moved through the public space. Similarly, just as the projections within Han’s car show us visions of redevelopment, they also implicitly demonstrate the changes in our own relationship to film and video. From the still interiors of modern transport, a scarce finger movement across a minute screen can send our minds deep into the complex international world of information while our bodies simultaneously hurtle through the physical world. It seems that maybe Han is asking us to consider a very simple question through this static automobile- Are we there yet? Han’s installation, Margaret learns to Drive from There to Here is currently on display at the MOCCA: Empire of Dreams exhibition, on until August 15, 2010. Take a look at other my other articles profiling artists from this show: Samina Mansuri, David Trautrimas, Alex McLeod and Dorian FitzGerald.